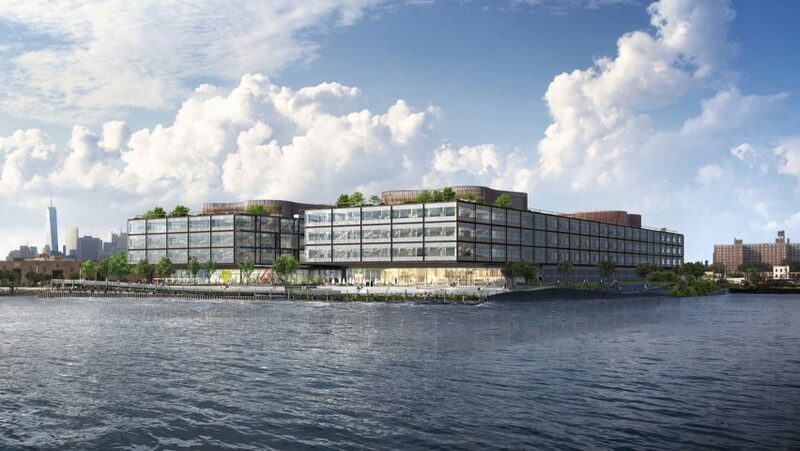 A proposed office complex by Foster + Partners on Brooklyn's waterfront has reportedly bitten the dust, and is to be replaced with industrial warehouses. New York developer Thor Equities has pulled the plug on the 800,000-square-foot (74,000-square-metre) Red Hoek Point project, which British architecture firm Foster + Partners unveiled designs for in 2016. The site close to IKEA was due to receive a pair of timber-framed buildings, and a landscaped waterfront public space by SCAPE, but is now earmarked for distribution warehouses according to The Real Deal. What would have been Fosters' first project in Brooklyn also included green roofs that employees could utilise, restaurants and retail at ground level, and a courtyard between the two linear structures. Open floor plans and high ceilings were intended to entice tech companies and creative studios, in an area that was expected to rapidly transform with similar developments over recent years. Construction had already begun on Fosters' complex, but little progress was made. It remains unclear why Thor Equities has cancelled the work – the website for the development is still live – or how the revised proposal will be carried forward. Dezeen contacted Foster + Partners and Thor Equities for comment, but is yet to receive a response from either. WXY's Brooklyn Navy Yard masterplan proposes "vertical manufacturing space"
Surrounded by water on three sides, location at 280 Richards Street was formerly occupied by a sugar factory – one of many industrial sites in the neighbourhood on the western edge of Brooklyn. Elsewhere in the borough, where jobs in the creative industries are booming, locations like the Navy Yard and Industry City are offering similar workspaces to those initially touted by Red Hoek Point. Foster + Partners might still be waiting for its first built project in Brooklyn, but the firm has plenty going on in Manhattan. Work is almost complete on the skinny One Hundred East Fifty Third skyscraper in Midtown, and the firm has designed an office tower as part of the huge Hudson Yards development.